One characteristic of gifted children is advanced language ability, which means these children reach developmental milestones relating to language earlier than developmental charts would indicate. This means that gifted children tend to talk earlier, have larger vocabularies, and use longer sentences than non-gifted children. How can parents tell if their child's language development is advanced? 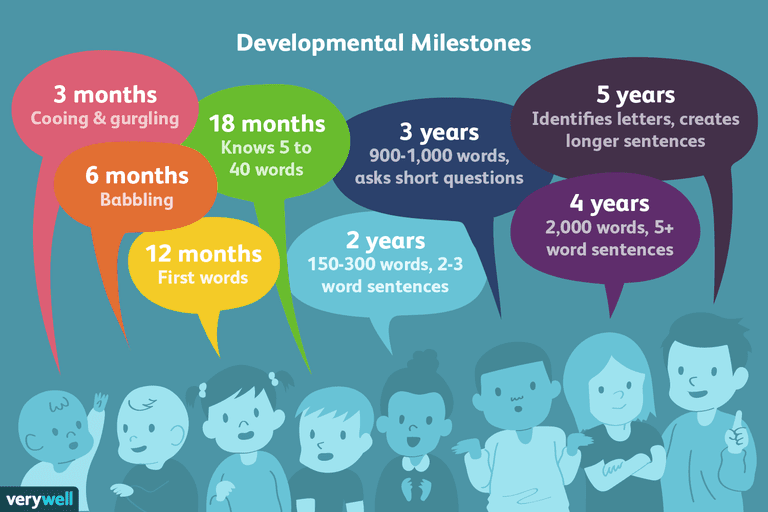 A first step is to look at typical language developmental milestones. A second step is to look at what advanced language development is. Uses two- to three-word sentences, usually in noun-verb combinations, such as "Dog bark," but also using inflection with combinations like "More cookie?" asks short questions, usually using "what" or "where"
By age 6, a child's language begins to sound like adult speech, including the use of complex sentences, with words like "when," for example. However, children tend not to use sentences with "although" and "even though" until about age 10. Gifted children tend to begin talking early. While most children say their first word at around 1 year of age, gifted children may begin speaking when they are 9 months old. Some parents report that their children said their first word even earlier than that, as early as 6 months of age. Some parents have even reported that their children tried very hard to form words at 3 months. However, most babies are simply not physically developed sufficiently to control their mouths, tongue, and lips well enough to make the speech sounds they need. They may pursue their lips and nearly turn blue with the effort and then become quite frustrated when they can't make the sounds they want to make. Teaching babies sign language is a good way to help these children express themselves without vocalization. It's important to note that not all gifted children speak early. In fact, some gifted children are late talkers, not talking until they are 2 years old or even older. When they do speak, however, they sometimes skip over the stages of language development and may begin speaking in full sentences. While early talking is a sign of giftedness, not speaking early isn't a sign one way or the other. An advanced vocabulary can mean two different things. It can mean the number of words a child uses and it can mean the types of words a child uses. While a non-gifted child may have a vocabulary of 150 to 300 words at age 2, gifted children may have surpassed the 100-word mark by the time they are 18 months old. At 18 months, most children have a vocabulary of from 5 to 20 words, although some do reach the 50-word milestone by the time they are 2 years old. In their second year, most children increase their vocabulary to up to 300 words. Gifted children, however, will have a larger working vocabulary, approaching that of a 4-year-old or even older children. The other type of advanced vocabulary refers to the types of words a child has in his or her vocabulary. Typically, the first words a child learns will be nouns: mama, daddy, dog, ball, bird, etc. After that, simple verbs are added, for example, want, go, see, give. Gifted children, however, will be adding connecting words, such as and or even because. By age 3, gifted children might also have added transitional words, such as however or multisyllabic words like appropriate. A typical 2-year-old can construct sentences of two or three words, often without a verb. For example, a child might say, "There cat" for "There is a cat." Gifted children, however, will often be able to speak in fuller sentences at age 2 and by age 3, their language may already resemble adult speech. They are able to use time markers, like now, later, first, and then, which, along with their advanced vocabulary and more complete sentences, allow them to carry on full conversations with adults. Although most gifted children have this kind of advanced language development, its absence does not mean a child is not gifted. The range of normal language development is also as widely variable in gifted children as it is in the non-gifted population. These descriptions of what might be typical of a gifted child are meant to help parents understand what advanced language ability looks like. Common Characteristics of Gifted Individuals. http://www.nagc.org/resources-publications/resources/my-child-gifted/common-characteristics-gifted-individuals. Frequently Asked Questions About Extreme Intelligence in Very Young Children. Davidson Institute. http://www.davidsongifted.org/Search-Database/entry/A10162. How Do Phonemes Help With Language Learning?